I did well for a week away from home. I had the apples cut out and a little bit sewn before I left for Victoria. Today I worked on getting them done and the photos for my post. I did not get all my red done. 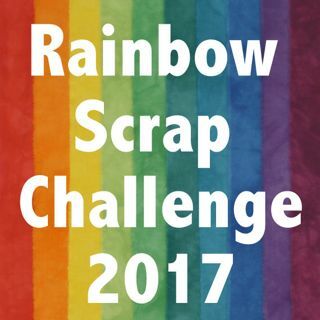 Today we were to start on our Multi coloured scraps for the Rainbow Scrap Challenge 2017. I decided to get a few prints with a hit of Red and other colours and call that my Multi coloured blocks for today. I love the Green and red apple core block, that fabric is kind of a ugly that I like. Then who would not love the bird fabric. This is a Red sample block all done by hand, well I was on holidays. I did it using English paper piecing and then appliqued the to the background. Lady bug Red sampler block. I have added today's scrap challenge post to Soscrappy. Take a look at what the others have done too. So sometimes I have taken the time to put all the blocks from the month up on the wall all together. I just love to look back at these photos but they take time to put it all up. This month I could not fit it all but most is up there. I am missing some Maple leaves and nine patches, just not enough room. I got this many Red blocks done this month! A strip set to add to 2nd Time Around but need to work on that more. Tonight I am working to get a few more Maple Leaves done. 6 more to iron and maybe a few before midnight. Then I need to move on to the real bin of multi coloured scraps. I have no idea what I will make. OK a list of a few ideas. I have Pineapple log cabins blocks to work on and they have some multi coloured fabrics and use many many colours. Wow, there are a lot of quilt blocks on that wall, and you say you still have more, very impressive. I love the fabrics in the paper pieced block. Your red blocks look amazing!! I love them all. the apple blocks are so cute! your montage on the wall is very impressive - nice! You had a very productive and beautiful red month! There's no April fooling about that! Wow!!! I'm thinking you just MIGHT like RED!!! Awesome productivity for the month. WOWWW that's an amazing design wall! These blocks told me they want to stay together in a fabulous quilt! The apple blocks, whole and cores are lovely. Quite the spectacular red wall. Your apple blocks are delightful! Wow, you certainly have made plenty of red blocks for the challenge.